An arsenic testing kit can help private well owners know the arsenic levels in their drinking water. Michigan is one of a handful of states with unusually high arsenic concentrations in groundwater. Sheridan Haack, a research hydrologist with the U.S. Geological Survey, says there are a number of counties in Michigan that have elevated levels of arsenic. Counties in the Thumb have the highest arsenic levels in Michigan, along with Oakland, Washtenaw and Ingham counties. And counties throughout much of the Lower Peninsula have at least some wells that have between 10 and 50 ppb arsenic. The highest arsenic concentration recorded for a well of known construction was 220 µg/L for a well in Lake Township completed in the Marshall Sandstone at a depth of 65 ft.
Data Michigan Radio obtained from the state show at least one well has measured even higher than that. 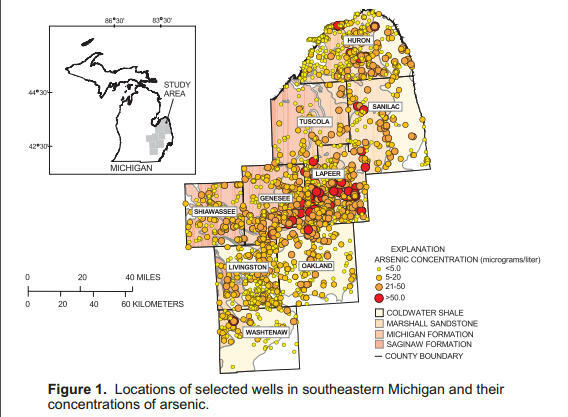 Michigan wells tested for arsenic in USGS study. "No organ system goes untouched"
Experts who study arsenic say it sweeps through our bodies, affecting organ after organ. "We're seeing associations with lower and lower exposure levels. And so are we concerned about the levels that we see in the United States? Absolutely, yes." “To some extent, we’re learning that no organ system goes untouched,” says Joseph Graziano, a professor of Environmental Health Sciences at the Mailman School of Public Health at Columbia University. “There’s neurotoxicity, there’s cardiovascular disease, there’s some evidence of diabetes, there’s a whole suite of cancers: lung cancer, bladder cancer, skin cancer,” he said. Graziano says emerging research is finding harmful effects from arsenic exposure at lower doses. The Environmental Protection Agency has been working to update its health assessment of arsenic. The EPA released a draft report on cancer risks from arsenic in 2008. Michael Hansen is a senior scientist at Consumers Union. He says "they put out their draft and that's where they determined, that based on these new data, that arsenic - inorganic arsenic - is 17 times stronger as a carcinogen than they [the EPA] thought." But that draft report from the EPA has never been finalized. David Heath from the Center for Public Integrity found that a single member of Congress delayed the EPA's assessment. Heath interviewed a lobbyist for two companies that sell weed killers that contains arsenic. The lobbyist admitted that he pushed Congressman Mike Simpson of Idaho for the delay. Simpson acknowledged that he inserted language into a report attached to an appropriations bill, and that effectively forced the EPA to lift a ban on the weed killers. Now, the EPA’s final arsenic health assessment has been delayed for several more years. Go here to find out more about testing your drinking water well for arsenic.